SLEMAN – Three Young Lecturers at the Universitas Muhammadiyah Yogyakarta (UMY) carried out community service activities in the foyer of the At-Ta’awuun Mosque, Dusun Jengkelingan, Potrowangsan, Sidoarum, Godean, Sleman, Tuesday (5/2). The activity that runs the College Catur Dharma made the design of the proposals that passed approved by LP3M UMY namely dr. Mahendro Prasetyo Kusumo, MMR (Lecturer in Management of Hospital UMY), Sakir, SIP., MIP, and Eko Atmojo, SIP., MIP (Government Affairs and Administration UMY Lecturer). 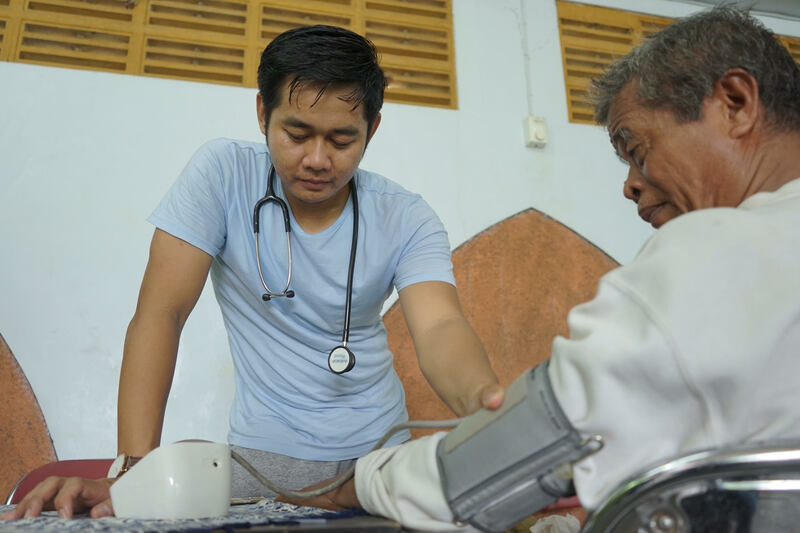 As the Chairperson of the Community Service Team dr. Mahendro Prasetyo Kusumo MMR explained the main focus of this activity was in the health sector. Especially non-communicable diseases, namely diabetes mellitus (DM) or commonly called sugar disease. “This is a serious threat for health workers to immediately take preventive measures, so that DM does not increase, including preventing complications due to diabetes mellitus,” he said. Furthermore, Mahe (as he is familiar) said that various programs to improve public health had been carried out by the government, but until now the program’s achievements were still not optimal. Therefore, three young lecturers in community service this time tried to create a healthy community with seven minutes of physical activity. One member of the community service team Sakir, SIP., MIP explained that seven minutes of physical activity began with joint exercise, followed by a health check in the form of blood pressure checks and blood sugar checks. Whereas for the people identified or positively affected by sugar, the team has prepared a questionnaire to fill out, then a sample of 30 people is taken. “This service is sustainable. We will record it, from here we will monitor its progress. After there is education, assistance, and treatment, there are no changes, reduced or not,” said the coordinator of the Government Affairs and Administration Laboratory.